I'm very much enjoying the New Frontier children's book series, Aussie Heroes. Like lots of us I guess, I know the names of many Australian heroes, but not too much about them. Recently I wrote a children's book review of Sir Edward 'Weary' Dunlop and today I'd like to give you a glimpse of Dame Nellie Melba. 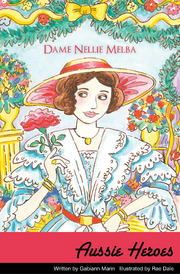 Dame Nellie Melba is actually the first published of the Aussie Heroes series. It was written by Gabiann Marin, illustrated by Rae Dale and published by New Frontier (2010). I've seen Dame Nellie Melba on the Australian $100 note - although not so often as I would like! I knew she'd given her name to the dessert, Peach Melba, and to Melba toast, that she was a famous Australian singer and that was about all. So I enjoyed learning about this Aussie hero. Marin chose highlights of Melba's life to depict for us, and put her exploits into the context of her time, 1861 - 1931. It wasn't common for Australia to produce world-renowned singers. In fact, when Melba went overseas, she was originally treated with disdain and contempt, and assumed to be rough and uneducated - a colonial. Marin unfolds all of Melba's story by choosing compelling scenes and letting the characters explain through dialogue and action, then weaving in narrative to lead us to the next scene. This is a boon for young readers. So often biographies of historical figures are lengthy narratives with lots of passive language, and kids lose interest. The other feature I applaud in the Aussie Heroes series is the inclusion of colourful art work. Dale has created cartoon-style illustrations with a historical flavour and authentic detail. These serve to add interest to the story, while also breaking up the text and making it more "readable". The front cover above is a perfect example of Dale's illustrative style. I believe it's important for children to read about people with perseverance, determination and a clear vision of what they want from life. Dame Nellie Melba knew from when she was a child that she wanted to be a great opera star, and she stayed true to her dream. The book also provides children with a fascinating glimpse into Australia's past. We see how powerless women were in many ways, even one as determined as Nellie. New Frontier have notes to accompany the book, useful for teachers and parents who want to help their kids extend the literature experience. From those notes I found a Youtube link of Dame Nellie Melba singing "Ah, Fors E Lui" from Traviata. This whole series ties in very well to the states' Social Science curricula (HSIE, SOSE etc), and the Australian Curriculum's History. The sturdy paperbacks make an excellent choice for the non-fiction section of any library.